EAST RUTHERFORD, N.J. — In the preseason, it’s so easy to make snap judgements based on bite-sized performances. Six months have passed since the last football game. Those long months, and the talent acquisitions scattered throughout, lead to a mixture of ravenous appetites, insatiable curiosities, and sky-high expectations. Some fans fall in love at the first sign of positivity. Others turn bitter over the slightest imperfections. So, don’t listen to the guy who tells you “Baker Mayfield’s a flippin’ stud! Start him, right now,” just because the Cleveland Browns rookie — and first overall pick of the 2018 NFL draft — recorded 212 passing yards, two touchdown passes and no interceptions in his preseason debut against the New York Giants. Both types bombarded my social media accounts Thursday night. And while you’ve got to appreciate the passion, both schools of thought are off-base. The truth lies several notches below the giddiness, but certainly in positive territory, and well above the harsh criticisms. Yes, it’s important to remember that Mayfield’s handiwork, which began with 1:31 left in the first quarter and extended a few minutes into the fourth quarter, took place against backups. And the Giants didn’t game plan for Cleveland’s offense. Nobody does in Week 1 of the preseason. 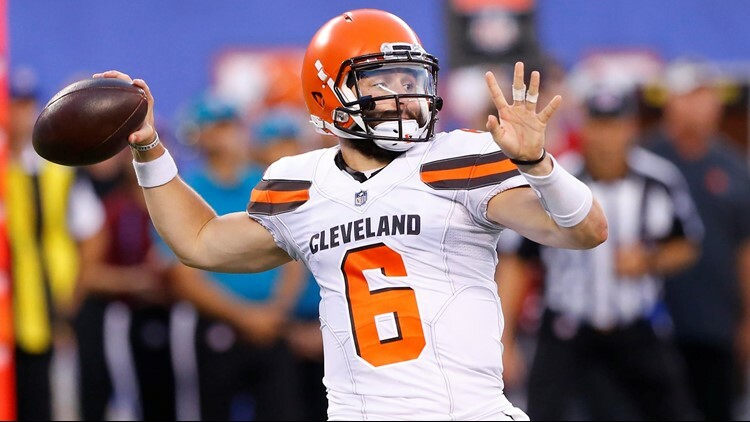 But despite those qualifiers, Mayfield did indeed produce a debut that should leave the Browns brimming with confidence about the long-term health of their quarterback position. Quality quarterbacking requires quality coaching and studying. It’s preparation. It’s game-planning. It’s teaching and equipping. The Browns’ offense — led by new coordinator Todd Haley — positioned both Mayfield and veteran starter Tyrod Taylor to play to their strengths Thursday night. But so much of the position requires intangibles that can’t be taught. It’s feel. It’s instinct. It’s anticipation, trust and resolve. Mayfield exhibited all of those traits Thursday night against the Giants. After an initial three-and-out that consisted of two handoffs and an overthrow by 10 yards, Mayfield came back with a 14-play, 72-yard touchdown drive capped by a 10-yard strike to a heavily covered David Njoku in the back of the end zone. On that drive and for the remainder of the game, pocket presence, anticipation and a quick release ranked among Mayfield’s greatest strengths. Many young quarterbacks struggle to ignore the pass rush. They’ll lose sight of their pass-catchers while peeking at the defenders crashing in at them, then they’re done. But Mayfield kept his eyes trained downfield while using his peripheral vision to help him sense and feel the pressure. Over he slid. Up he stepped — avoiding would-be sacks — and delivered throws. Mayfield also displayed a strong internal clock. He knew when to scramble solely for the purpose of buying time for his receivers to get open, and other times he knew when to go off-script and run. (All three of his scrambles produced first downs). Mayfield trusted his receivers to make plays. He fit the ball into tight windows, often throwing them open with pinpoint accuracy. But one of the greatest displays of trust occurred on the sideline and in the huddle. Wide receiver Antonio Callaway had endured a rough week after a traffic stop that led to marijuana possession citation. Thursday night, he got off to a rough start, failing to record a catch in three targets. But Mayfield stayed in Callaway’s ear, telling him not to get discouraged, telling him that he needed him. In the second half, Callaway recorded three catches on four targets, and produced the biggest play of the game: a touchdown off of a 54-yard catch-and-run. “Right before the play, Baker told me if I get a single-high (coverage) to win on the slant, and I did,” Callaway, who finished with a game-high 87 yards, said. Callaway did get a step on the defensive back on the slant and Mayfield put the pass right on the money. “I just told him to keep fighting through it because I needed him,” Mayfield said. That’s the guy that I heard about leading up to the draft: a leader with an ability to connect with and inspire teammates, spurring them toward better performances. That’s one of the things that so strongly impressed Browns brass about Mayfield. This team — long downtrodden and owners of a 1-31 record in the last two seasons — finds itself in the midst of a psychological makeover. Coach Hue Jackson largely credits his quarterback group for the change. The beauty of the Browns’ quarterback situation is that for all his potential and any positives displayed Thursday, Mayfield remains in the developmental stages, and Taylor’s presence enables Jackson & Co. to patiently work with the rookie while starting the veteran so they can compete now. Taylor’s a cool customer, who has endured a lot during his underappreciated career. Thursday night, all he did during two series of work was complete all five of his pass attempts for 99 yards and a touchdown. This is Mayfield’s team eventually, but for now, Taylor is the unquestioned leader internally. Because of that, Jackson sees Taylor as the perfect mentor for Mayfield. The rookie agrees and said that he wasn’t even nervous about his first NFL game action because he had watched Taylor and between series, they reviewed the Giants’ defensive tactics. Then, with Taylor having set the tone, Mayfield followed suit. Although this Browns team has an edginess and improved confidence, no one is naïve enough to think that tough days don’t lie ahead. No snap judgements here. Throughout the locker room, while giving postgame interviews, players discussed their shortcomings rather than dwell entirely on the triumphs versus the Giants. But Thursday night represented a good start, both for Mayfield, his tutor, Taylor, and the team as a whole.